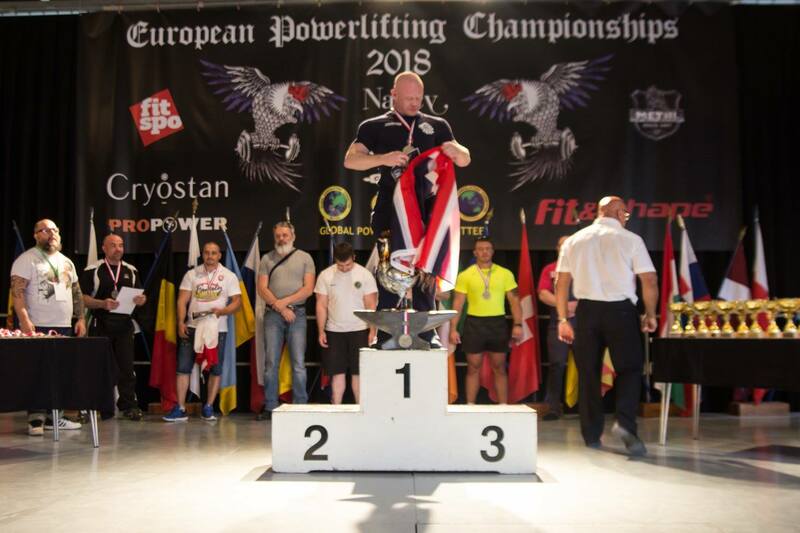 After a long period of Injury and illness Chris Morgan has returned from the GPC European Powerlifting Championships in Nancy, France with a Gold Medal in the Masters 2, Unequipped Deadlift and has set a new British record at 235 kilos at a bodyweight of the 88.8 kilos class (90 Kilo Class). Chris will arrive at the Gay Games in Paris this summer as a current European and World Champion. It’s wonderful to be back in the Great Britain Team representing my country again, this time winning medals and setting records in Masters categories. Powerlifting as a sport has always helped with my own personal evolution, so to be back after a short career break, it feels wonderful”. “What Powerlifting means to me has changed over this last few years, with me starting to enjoy the sport again thank to the members of GPC-GB, I feel very grateful to have this opportunity. After so many injuries over this last few years, it feels wonderful to be back in contention for medals and records”. “I’m very much looking forward to representing the Federation of Gay Games in Paris as one of their Global Ambassadors, helping them to promote their Scholarship programme and assisting them to deliver the message of – Participation, Inclusion, Personal Best”. The Gay Games are happening in Paris on August 4th -12th and as of 16th June there are 9,500 participants already registered. Details about Gay Games can be found at www.paris2018.com and www.gaygames.org Chris will be available to press and media from Friday 3rd to Wednesday 8th of August in Paris. Chris has been one of the UK’s leading openly gay athletes since starting his Powerlifting career at the Gay Games in 1998. During his eighteen year career he has represented England and Great Britain a total of twenty six times, where he has taken a total of twenty eight international medals. He has been World Champion nine times, European Champion Four Times, British Champion Eighteen times and has won six Gay Games gold medals. From 2010 to 2015, he was the overall Best Lifter six times at the British Deadlift Championships consecutively and in 2011 was the overall Best Lifter at the European Deadlift Championships. He is the holder of several World and British records in the Deadlift and is a qualified International Category Referee. Chris is constantly working for the organization that gave him confidence to be an openly gay athlete, as a global ambassador. His role for the Federation of Gay Games is to inspire and motivate young gay athletes worldwide. He is also the Co-President of the LGBT Powerlifting Union and the Meet Director of the LGBT International Powerlifting Championships.